Recently we gained copies of the accomanying two photos so it seemed appropriate to recall more about the Berowra Village Centre (the original name). After canvassing a few sources I have learnt that the Centre was opened in 1970.It was built on land in Turner Road that was formerly two farms owned by the Hazlett and the Lailey families, we believe. So far I do not have a definite list of the original businesses in the centre. While talking about this centre a list of some 14 or so businesses emerged as having been part of the complex at some time during the 20 plus years it was open. Included were a Hardware, Butcher,Newsagent,Pizza, Jeweller and Bank plus St Vincent de Paul, Accountant and Doctor’s Practice. Can you help name the original businesses or perhaps you have some photos or stories to share related to this local shopping centre? The above images are courtesy of Hornsby Shire Historical Society. After World War Two finished in 1945 and ex-servicemen returned to civilian life, many couples married and began buying their own quarter acre blocks (around 1,000 square metres) in Berowra. One such couple was Jack and Kath Molyneaux who bought 47a Woodcourt Road in 1949 and six years later purchased number 47. Building materials were in very short supply so instead of building a large garage in which to live, as many couples did, Jack and Kath built the left hand end of their future home. This took nearly two years and by then their eldest child, Chris, had arrived. Roof titles were available only after being on the waiting list for about six months so a temporary “roof” of “Malthoid”, (two ply felt impregnated with bitumen) was used instead. (pictures 1 and 2) It was held down by battens, but one day huge hailstones punched holes in the “Malthoid”! Imagine the mess! Finally, by 1953, the rest of their home was completed. (picture 3) If you look at 47a today, you’ll still see the chimney but because the house has been extended over the years the chimney is now in the centre of the dwelling! Picture 4 shows Chris, in the corner, cooling off in Molyneaux’s concrete wading pool, with some young neighbours. The pool converted to a sand pit in winter. Note the old 44 gallon drum, with lid and brick, used as an incinerator. This wonderfully evocative image has captured the majestic beauty of Berowra Waters. The weather is clear and the passengers look relaxed and enraptured by the view of the river from that vantage point. The picture was taken in 1964 by an unknown photographer, and what also dates this period are the cars stationary on the punt – one looks like a fairly new FC Holden Ute and the other could be a Chrysler. This is one of the many old punts that has ferried passengers back and forth over many decades. On an average the punts have been replaced about every ten years, but someone may be able to enlighten us on this matter. The punt is heading west towards the Dusthole Bay side of the Water. It’s getting ready to dock as we can see in this image the landing gear is down, so the vehicles and passengers can safely disembark and continue their journey up towards Arcadia or perhaps they could have been planning a swim and a picnic on that side of Berowra Waters, which was far less commercialised in that period. From local accounts, as the ferry left from one side, kids in the vicinity would grab hold of the back and hang off until the time was right to get on top of the passenger cubicle and make the big dive off into the Waters. Sweet memories of a long hot summer on Berowra Waters. This is the story of 6 or 7 Berowra teenagers who in about 1956 discovered the dismembered parts of an old 1931 Ford. They lay scattered around in an empty block – 57 Woodcourt Road, Berowra. Photos 1 and 2 show the parts being surveyed. A decision was made to reassemble it so the work began. The boys ranged in age from 14 – 16 years. When the task was finally successfully completed, Photos 3 and 4, they drove it up to Roy Corrigan’s Ampol garage – corner Berowra Waters Road and Eastern Road. The Registration was never granted! Note also Corrigans Busses and the old pine trees on the block next door, which is now number 109 Berowra Waters Road. What became of the “car” is not known, but registered or not I think they got much pleasure from all their hard work. The above 3 photos of our deck,side garden and the road in Coreen Close are labelled as being taken in 2000 when our suburb received a drop in temperature,followed by thunderstorms with heavy rain and hail. The force of the downpour shredded leaves from some plants. Do you recall this event? The 24th January 1999 ‘..Heavy rain and flash flooding in Sydney. Severe thunderstorms developed over the Greater Sydney area during Sunday morning.Very heavy rain was reported over eastern parts of the metropolitan area.Another storm produced torrential rainfall over some Northern Suburbs with properties in Berowra damaged and the main northern highway cut at one stage. Berowra Heights had 141 mm in 24hrs to 9am Sunday. Maybe I have the wrong date on my photos?! Do you remember when the former Berowra Village Shopping Centre was damaged in a bad storm? Do you have any photos? Today’s image from circa the 1930s is a professional photo stamped on the back: F.DEGOTARDI WILLOUGHBY. What an interesting gathering of yesteryear’s vehicles of all shapes and sizes! In this “car park/queue” by Berowra Waters you will notice hard top and soft top vehicles, two seaters, five seaters, buses with and without luggage racks, a small truck and perhaps a partially obscured motorbike with a sidecar. Can you identify some of the models of vehicles? Men and boys have gathered near the circular omnibus stand sign while three able bodied people, desisting from claiming a place in the cabin, are seated in the back of the small truck. Is that possibly another cluster of people close to the water towards the Rex Jones REFRESHMENTS advertising sign? Our thanks to John O’Neil who donated this photo, in a set of eleven, from the collection of the late Pam Gartung. Our recent guest post by Roslyn Mort has sparked memories for another Berowra resident, David Lever. David has shared the beautiful photograph above of another trig which was once in the Berowra region. David notes that . . . Does anybody else remember the trig stations which were once such a central part of our surveying history? If so, we’d love to hear from you, and of course see any photographs you might be able to share! This unique glass vase was purchased by long-time Berowra resident Merle Davis at auction in 1984 from one of the first homes built in Berowra circa 1895, called The Laurels. The auction comprised an extensive list of antiques and collectables; it attracted a huge crowd on the day with many bidders and spectators vying for some spectacular items. The Laurels was a well-known guesthouse in its heyday, a welcome retreat for people mostly escaping the hubbub of city life on the weekends. Unfortunately the house no longer exists due to the recent redevelopments happening in Berowra. An exceptional piece of hand-blown glass made during the turn of the last century, the vase is stylised in what is known as the ‘grotesque’. It was fortunate that my mother-in-law then gifted us the vase, which remains a great talking piece with our visitors due to its unusual design. One friend suggested that perhaps a collective of glassmakers around the1900s had made it. She could see it as an experimental piece, its production would have been done after hours by hands utilising the left over’s of the working day. 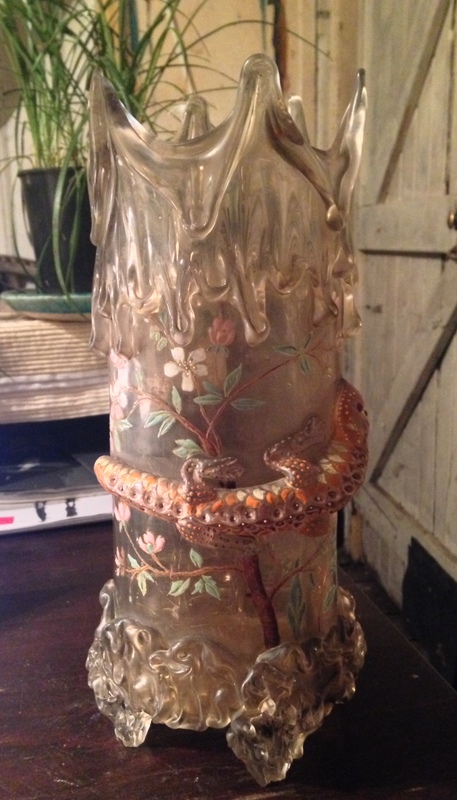 I have found no other vase comparable to this one and certainly agree that this late Victorian vase in the spirit of its making has stood the test of time. Can you add any information?